Since the most-recent recession, more and more people are pinching pennies, or, at the very least, being much more mindful of where their money is going. Few families were left unscathed by that 18-month financial crisis beginning in late 2007 to mid-2009 and its repercussions. As a result, homeowners are more mindful of energy consumption. A wise homeowner will peruse the energy bill to understand the charges and ask why they might be higher than normal. Don’t resort to scrimping the A/C usage or letting an open window or fan suffice. It behooves you to understand why your energy bill is high. A high water bill is easy to discern and the “fix” is simple – just use less water. But you can’t see electricity so how do you know how much is too much electricity being used by you the consumer? Most people are familiar with the concept of having an energy audit done in the home. You can have an energy audit done through your energy provider or hire a professional energy auditor to go through your home and determine the source, if any, of your extra energy use. Often this involves finding leaks or cracks in the foundation, or around windows or doors. Even a recessed skylight might not fit properly and allow cold or hot air to infiltrate your home. Even though your home may be older, it is still possible to make the home more energy efficient. If you’ve had an energy audit done, and you still find your electric consumption is high, your next step is having a professional electrical audit performed in your home. Simply contact a top electrician to schedule a consultation. Most people just get their energy bill and pay it. They peruse the bill quickly, and, based upon the weather – if it has been extremely warm and the air conditioning has been running non-stop, then a higher bill is not out of the ordinary. Homeowners are indeed savvy enough to know that many big-screen televisions or a lot of energy-draining devices being used by most family members equals high electrical consumption. A big family generates a lot of laundry and those electrical appliances may be running many times a day. If you try to analyze your electrical usage by performing your own electrical audit, you would need to determine the energy usage for each appliance to identify and single out the culprit. Many energy providers now use advanced digital meters or “smart meters”, and, in conjunction with a smart phone, you can view exactly what energy usage the particular device is using. There are online calculators to help assess energy usage depending on your appliances and how often you use them. 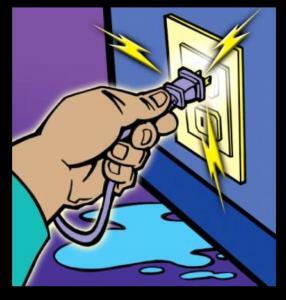 If you’ve tried the small fixes to reduce electrical consumption in the home, i.e. running smaller loads of laundry in the dryer so that appliance needn’t work so hard, or replacing your incandescent bulbs with CFL or LED bulbs (both inside and outside) or using dimmer lights and three-way bulbs for various task lighting, and STILL your electrical bill makes you gasp, then perhaps an electrical audit is in order. Did you know that CFL bulbs use a whopping 70 to 90 percent less energy than the traditional incandescent bulbs? That means lots of savings for you – money going in your pocket, rather than that of your energy provider. If the methods of electrical consumption tried and analyzed above, haven’t had an impact on your energy bill, then it is time to consult an electrician to have an electrical audit performed at your home. You can opt for the audit to be performed through a home improvement store, or sometimes even vendors such as insulating windows will offer to conduct the audit for free, but, this option, of course, leaves you vulnerable to signing up for a product you might not necessarily need. That is why it is wise to skip the freebie and go through a top licensed electrician. What does an electrical audit entail? A skilled electrician will come to your home to conduct an audit to 1) calculate how much electricity you are using in your home; and 2) determine where that electricity is going. That inspection should take a few hours depending on the size of your home. Some electrical auditors charge by the hour; others will charge by the job. If there are energy-consuming recommendations, such as a furnace, for example, the audit may be considered tax deductible if you will take measures to correct the issue, such as purchasing a high-efficiency furnace. Some of the terminology involved in the audit will be: electrical audit (the accurate tally of the heat and electricity use in your house). This would include all appliances. The electrician will then use an energy meter to determine kilowatts and a spreadsheet to explain your electrical usage. During his analysis, the expert will study voltage, charge (pressure measures in volts), current (flow of the charge measured in amps) and power (electrical power measured in watts) and energy (electrical energy measures in watt hours). He will analyze loads (any electrical device plugged into the wall) and phantom loads (electrical devices plugged into the wall that drain excess power). Whew! All that is happening in my home! At the conclusion of the electrical audit the electrician can help you to identify the waste so that you may resolve the problem(s) that are causing the extreme electricity usage going forward. The price of the audit is inconsequential, considering the money you will be saving down the road in lessening your energy and/or electrical consumption, and, in doing so, helping to create a better environment.